I don't think I express enough my excitement over Nails Inc. SS17 collection. From the Long Wear collection to the Mindful Manicure collection to the Acai Bowl Colour & Care collection, there is truly enough variation to suit the majority. 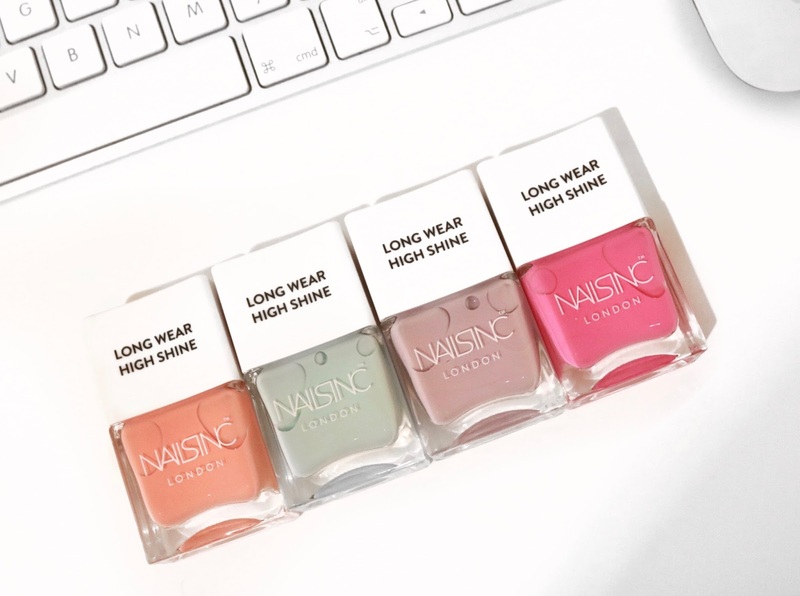 I absolutely love the colour palette of the Long wear nail polish collection and the concept behind the Mindful Manicure collection. I have gone ahead and swatched each nail polish from all three collection so you can have an idea of what they look like. 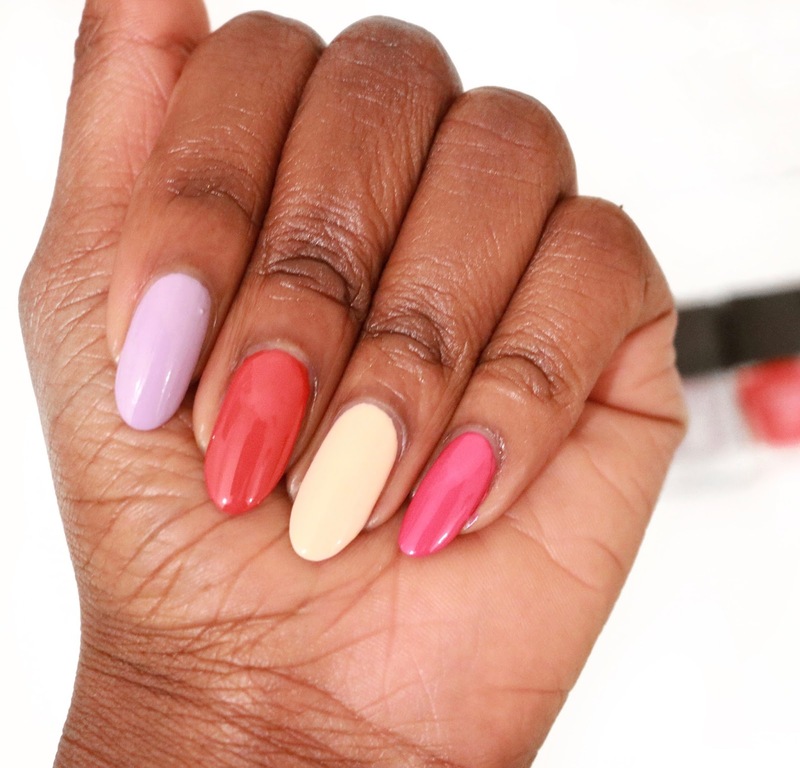 You can check these swatches out below. 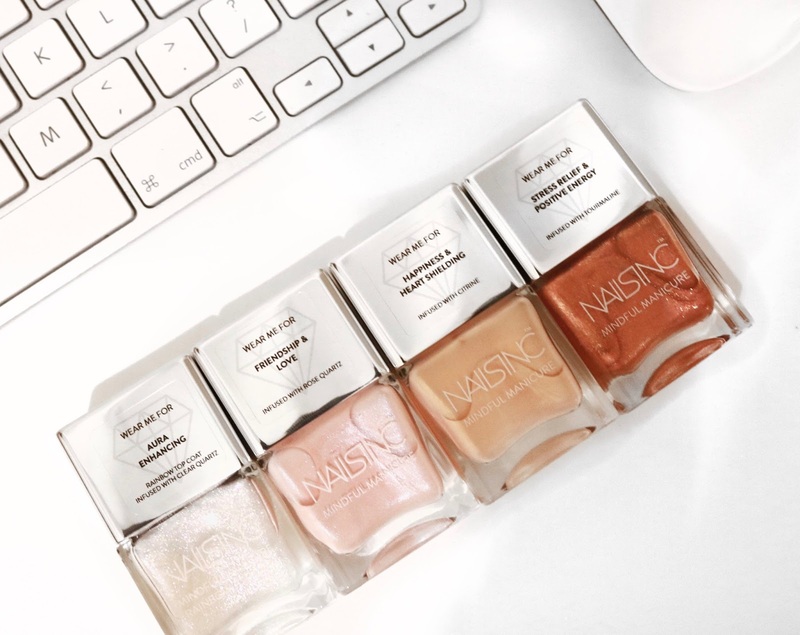 All polishes in the Mindful Manicure collection has been infused with real gemstones and according to Nails inc 'Each crystal has an electromagnetic power that is said to intensify a persons aura helping to clarify thoughts, channel energy and heal." In addition, each polish has its purpose wear. Good Vibes, the rainbow top coat has been infused with clear quartz and should be worn for aura enhancing. Better Together has been infused with rose quartz and should be worn for friendship and love. Future brights has been infused with citrine and should be worn for Happiness and Heart Shielding and finally And Breathe has been infused with tourmaline and should be worn for stress relief and positive energy. I am believer in self fulfilling prophecies so I believe that if you wear one these polishes with the belief that it will act on its purposefulness then chances are it will. 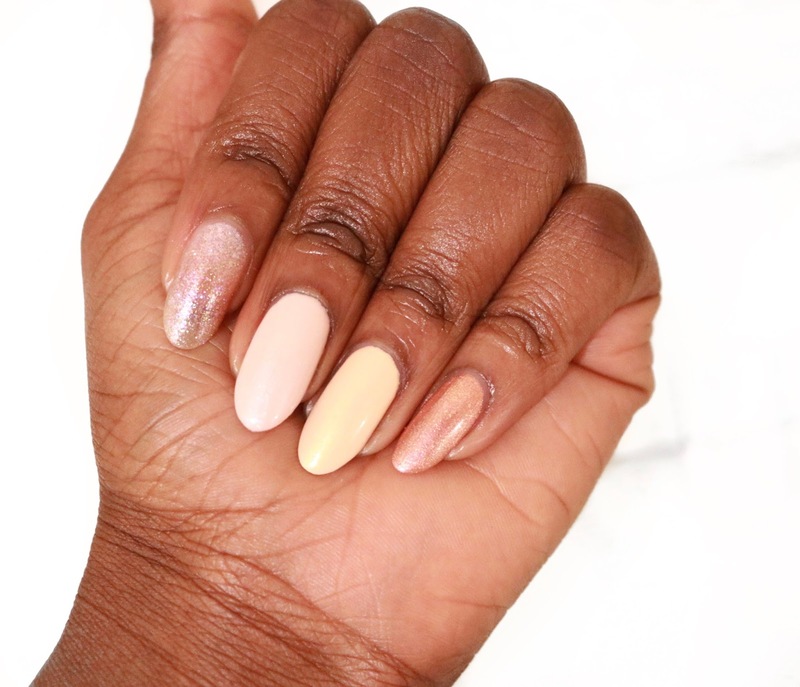 However it has to be said that even if you aren't a believer of the concept behind the Mindful Manicure the colour polishes featured in the collection are very much on trend. Especially with its metallic and iridescent finish your nails will be shining bright and will add a touch of sparkle to your outfit. I swatched each polish individually including the Good Vibes top coat in this post to give you guys a quick snapshot of what the entire collection looks like. I will be experimenting more with the Good Vibes top coat along with the other polishes from the Mindful Manicure collection at a later date and I will be sharing these in a post or two with you. The long wear collection features the formulation to enable a long wear and a high finish to you manicure. 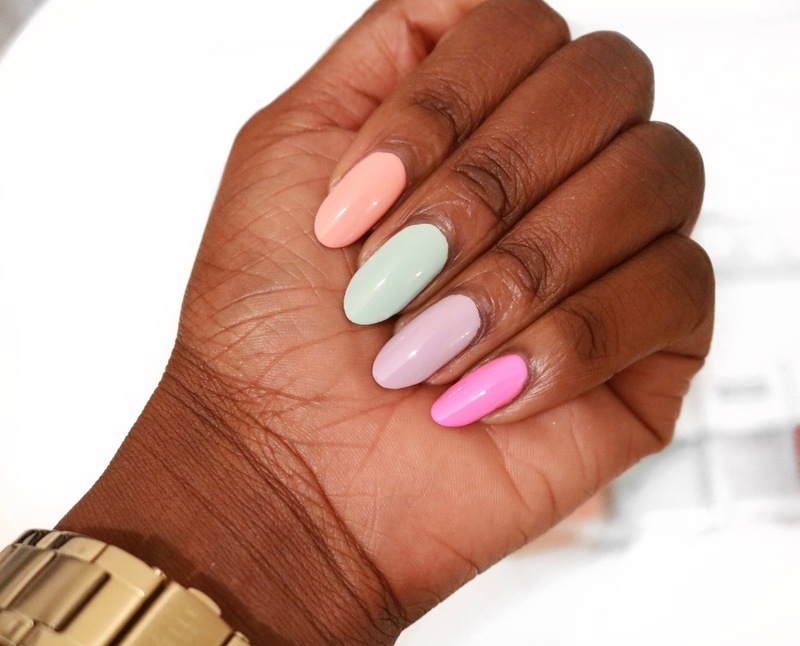 The pastel colours are going to be perfect for the upcoming spring summer season. I am currently wearing the peachy shade of Chelsea lane and I am absolutely loving the pop of colour it adds to my outfits. Neeedless to say it has gained a great deal of compliments as well. 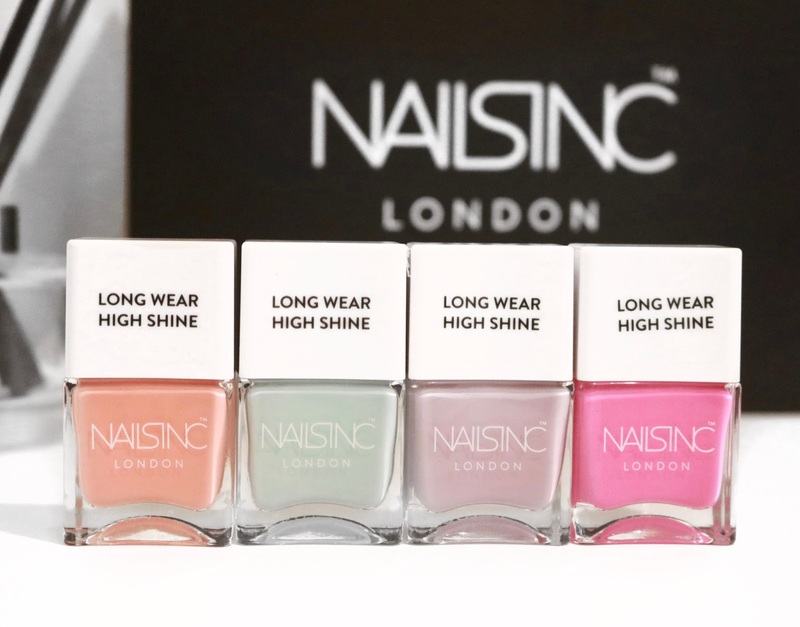 The long wear polishes are limited edition and only retailing for £11 so you better grab yours before it sells out. After swatching the polishes from the long wear collection, peachy shade of Chelsea Lane is my outright favourite followed by the lavender shade of Cambridge Grove then the mint green shade of Dovehouse Green and then finally the bright pink shade of Harrington Gardens. Let me know which colour shade you like the best. I think I will be opting to wear Cambridge Grove next. 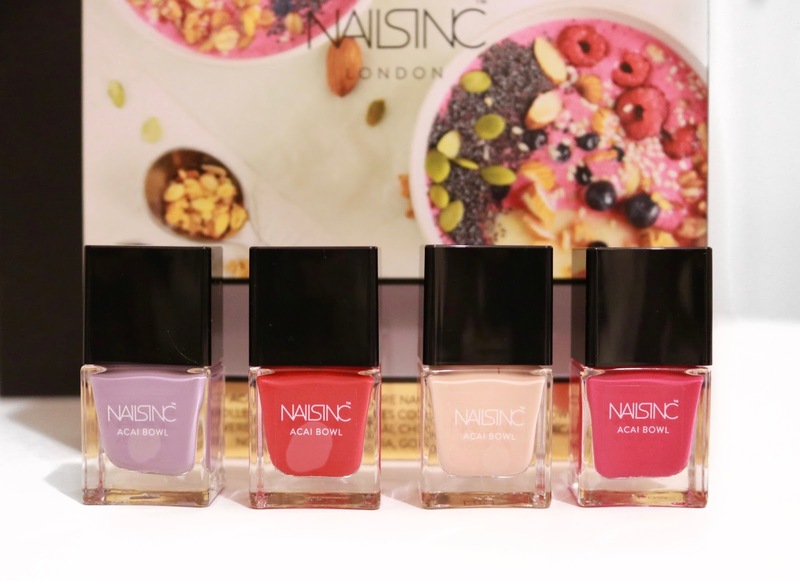 The polishes from the Acai Bowl colour and care collection all contain superfoods, in the nail paint formulation to deliver nourishment and protection to your nails. Once again the colours featured are bright bold shades which are ideal for the spring summer season. Face Masks have become one of the season's popular beauty trends and I for one I'm down for them. I am yet to try the Face inc mask but I have no doubt that I will be loving it based off the amazing things I've heard about them. 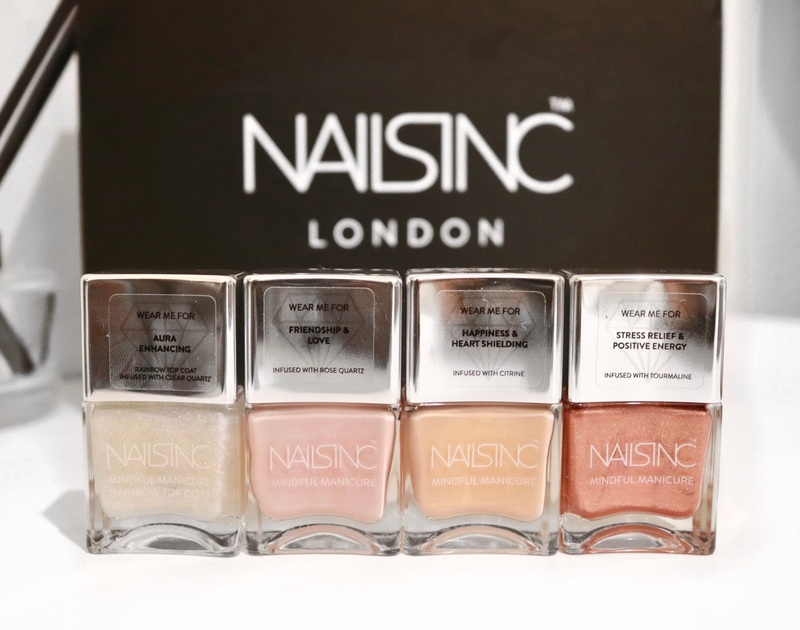 Nails inc at present have four different variations for different uses, I was sent the cat nap by the Nails inc press team to try out. 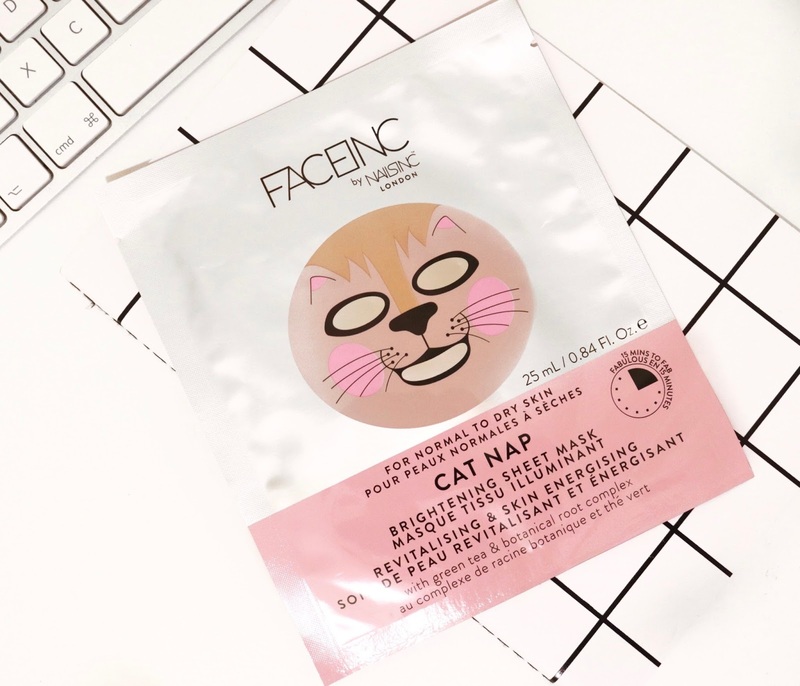 The cat nap brightening sheet mask is suitable for normal to dry skin and features green tea acting as an antioxidant to protect the skin and also features botanical root complex to provide intense moisture while firming and calming the skin. The cat nap mask in particular is ideal for those who've had minimal sleep and want to brighten their skin to dispel any signs of fatigue. The mask is the ideal choice to transform your skin fro drab to fab in 15 minutes. To this day Nails inc Kensington Caviar has been the 'bestest' top coat i've ever used. It is fast drying and provides a lasting glossy finish to my manicure. It has been my go to top coat for the past couple of years. 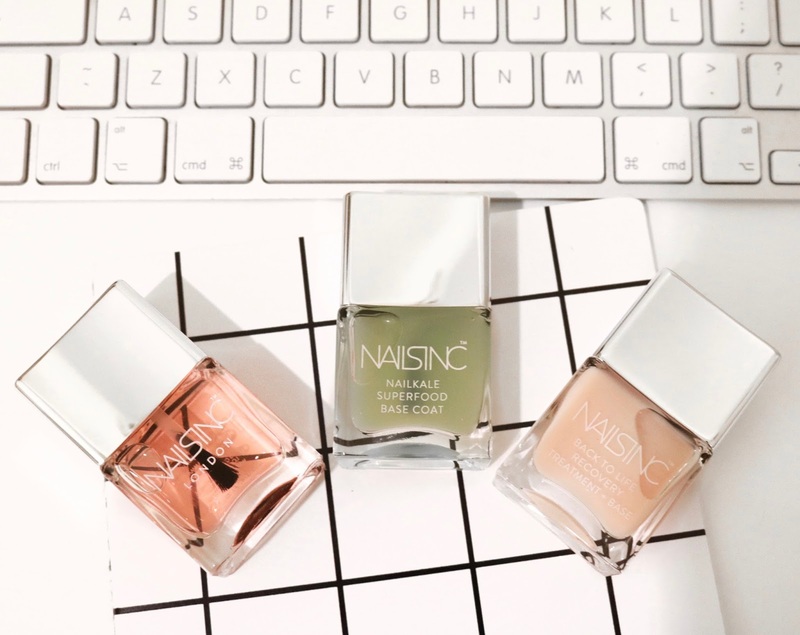 When it comes to the base coat, I have become rather quite fond of the Nailkale Food base coat which has been infused with kale extract to help strengthen and protect your nail beds. The Kensington caviar top coat and nail kale superfood are a must have for any nail paint fiend out there. As it will help you to create that salon finish manicure from the comfort of your own home.